The 7th Redevelopment Zone occupies the area in between WenXin Road, HuanZhong Road, Henan Road and Dadun 4th Street. This area is the future site of Taichung's new city government center and the entire redevelopment area is about 3.5 million hectares. Because the "development zone" is actually many smaller areas and the neighborhoods are quite nice in general, the land is worth a lot of money. North of the 7th Redevelopment Zone, there are also department stores, nice restaurants and other large buildings which add the area's value. The new governmentl center will be located right next to two hundred-meter pedestrian paths and surrounded with greenery, providing a nice place for a walk. On both sides of these green walkways sit top-end residences--most of these buildings are among the top apartment buildings in Taichung. As they are gathered in a single area and it would be difficult for their prices to collectively drop, making this a good opportunity for real estate investors. This area is "hot" for many reasons. First, the future for investments in the area seems quite optimistic. Second, the rising cost of gasoline, as well as reinforced concrete and metal building materials, will add more value to the construction. 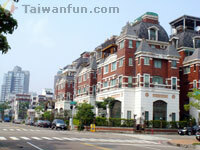 Next, Taiwan is currently enjoying a robust real estate market. 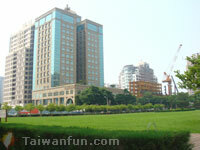 In fact, a lot of the overseas Taiwanese businessmen have returned to work on the island. And, finally, because this area is such an asset to the present and future of Taichung, there is no predictable drop in value on the horizon. Within the next three years, there will be several other huge construction projects to be completed; in fact, construction is growing 20% every year. Several essential future city construction projects are located within the 7th Redevelopment Zone, including the Taichung Metropolitan Opera House. Scheduled for completion next year, the opera house was designed by Japanese architect Toyo Ito, who has brilliantly incorporated the opera house into the surrounding shopping districts. The second major project on the horizon is the Taichung International Convention Exhibition Center. Constructing a compound on 4.5 acres of land that includes a hotel, shopping mall, multiple bus stations, and a convention center won't be easy, but the government predicts that it will bring in about 100 million visitors every year and a great amount of business opportunities. As far as transportation construction goes, the government is building a road extending from ShiZheng Road to DongHai Street, which will also connect with TaiChungGang Road. The construction of this road will make traveling to and from the Taichung Industrial Park area more convenient; it will also take motorists straight to the Taichung Science Park and the 7th Redevelopment Zone. The last reason that the 7th Redevelopment Zone is a highly competitive area is its proximity to the 12th Redevelopment Zone, where the Taichung-Changhua Expressway and the High Speed Rail Station are. Visitors coming via the highway or railway can have easy access to the area which, besides all of the upcoming projects, also houses attractions like Fengchia Night Market. With an edge in the Taichung real estate market, the 7th Redevelopment Zone is certainly a golden brick in Central Taiwan.